Just look at those colours! You wouldn't think we had it cold and grey here today at all. I am working on a little project and it seems to be lookin' like it's going to work out just nicely, even if I do say so myself. Oh and yes, that is white elastic you can see that I am currently working into my last row of yellow. Hmmmm, interesting, but I am unable to reveal just yet. 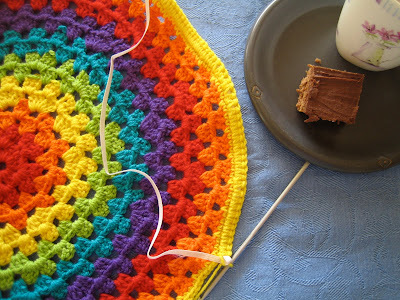 What I can reveal to you, however, is how to make a beautiful perfect every time granny circle. All you have to do is go Here for a full and very simple step by step tutorial by the very lovely and ultra-mega-wonderful Alice. Make sure you say hi, I just know she would love that. Enough chatter from me here now, I am off to do the 'rounds' lol of all my lovely blog friends and see what they have been up to these last few days. So tell me, what's on your table this Tuesday? WOW!! That looks amazing. I must take some time to learn how to make one of those. I'll bookmark the lesson. Rainbow colours are just the best aren't they? Sorry to hear you are having a grey day today, we have brilliant sun which is a huge surprise. beautiful happy rainbows joyce, that is lovely. and is that cake!! Oh Joyce that is one stunningly beautiful mandala! I gasped when I saw the beautiful beautiful colours! I can't wait for the big reveal!!!!! Re the hat... I can't knit on circs, I've tried and its just not happening for me! I freestyle my hats because i cannot follow patterns... I cast on about 90-96 for my big head, then k2 p2 for 10 rows for the band, then increase every 5 stitches in row one, (knit), p 1 row, inc every 5 stitches and so on and so on until I think it'll be big enough. Oh I just ♥ those colours!! Hi Joyce! I just ADORE rainbow colours! They are the brightest and happiest things ever. Very interesting how you are crocheting that elastic into it - that's definately something for me to learn how to do. I can't wait to see what it will become either! Great looking granny circle, heading over to Alice's! Hurry up and reveal Joyce! I can't wait to see the FO!!!!! When I saw this I thought of Tye Dye T-shirts! My daughter was a big fan of them when she was younger and we used to buy dozens at the farmers market in New Mexico. I can't wait to see what this will be! Will it be a beret? Hello, oh wow, thank you so much for your lovely comments and excitement. I have actually finished my little rainbow project and unfortunately being night time here, the photos will have to wait til tomorrow. What I can tell you is that it worked, woo hoo *little dance of joy* and the most wonderful news is my boys LOVE what I have made. Their faces turned just as bright as the colours in the yarns. Sarah, oh yes, check out Alice and bookmark, its a must. Angelina, ieww spring cleaning, but it's wonderful when done. Yes, it's a choccie slice. oh so yum. I can't share it tho, sorry, it's from a cookbook and I don't think I am allowed to share. Alice, thanks for your hat pattern, I am going to come back to that and do one for me. As for the mandala, inspiration totally come from you. Thank you. Hi Lillabilly, re the elastic, I took some photos to remember it for myself, however, can do a little tutorial on it if you like. It's easy enough. Thank you all for your lovely comments. Yes, head to Alice's blog and show me what you make. I would love to see. Circles are the best, so calming and 'round' - lol. I just love curved softness. Cynthia, ohhhhh love tie dye shirts.